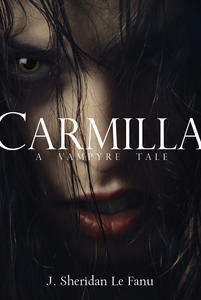 Laura is telling this story of her encounters with a young woman she knew as Carmilla. Laura lives a sheltered life with only her father and two governesses for company. She was about to gain a friend when her father's old buddy and his ward come for a visit. However, days before they are expected, Laura learns she has died under mysterious circumstances. After hearing this Laura is in the doldrums; then a carriage crashes right in front of the estate. A lady and her daughter emerge from the wreckage. The lady is okay but in a rush to get to her business which is all very hush-hush. Her daughter Carmilla is dazed and the lady begs Laura's father to take her in. How can a gentleman refuse? Laura makes fast friends with the beautiful young lady. She has the feeling that Carmilla is a little off- she's secretive, lethargic, talks trash about the peasants, really clingy- but still can't wait to see her everyday. During this time, there are several deaths in the village, all blamed on an illness. Laura herself isn't feeling so good and a doctor is called. Then an unexpected visitor arrives with a startling story. Carmilla is a novella, all of 3 hours of listening time. It was a perfect book for Halloween. I've been burnt out on the recent vampire trend. Going old school and reading this early gothic vampire story is the cure. Bram Stoker was inspired by it and it resembles the Lucy part of Dracula. Actually Carmilla is a much better version with less swooning and histrionics. Thankfully there aren't 4 men droning on and on about the ladies' precious virginity. Le Fanu has a way with prose and the writing is quite luscious, even better is that it's read by Megan Follows. Carmilla is the most interesting character in the story with the best dialogue. Laura's vanilla pudding in comparison. Much of the conversations between the two girls reminded me of the ones had between Louis and Lestat in Interview with the Vampire. Which brings me to the lesbian overtones of the story. It's mentioned in just about every article referring to Carmilla. It's hard for a modern reader not to see it when Carmilla says things like this to Laura: "Darling, darling," she murmured, "I live in you; and you would die for me, I love you so." Duh. Carmilla's attachment is almost parasitic; she clings to Laura and imposes her will upon her. It does fall in with vampire lore that they use their sexuality to dazzle and charm their victims. For Laura's part, Carmilla's affection makes her uncomfortable at first, but gradually becomes more accepting. She's quite naive and a little stupid. It takes her nearly to the end of the story to put 2 and 2 together. Carmilla is short but beautifully written. I had several questions that left me thinking about the story's conclusion long after I was done. I'll be looking for more Le Fanu to read. About the Audio: Megan Follows, Anne Shirley from the Anne of Green Gables miniseries, does a beautiful reading the the book. She has excellent enunciation. There is a sample on the webpage for the book. I'll be listening to it again in the future. This was a free audiobook on Halloween from AudioGO. It's only $5.97 right now. I am not into books about vampires, but despite that this one sounds very good! A vampy girl-crush. A bit different... sounds kind of good! I've hear of this book while writting my short history of vampirism but now I want to read it because of your review! Thanks! Lola- It's quite gothic, you might not mind it. Anachronist- Great! Hope you like it. I am getting sick of vampire stories, but this sounds good. I might think about it for next Halloween.